This chapter provides an introduction to digital simulations for those interested in using or designing them for instructional purposes. There has been some disagreement in various circles about how to define simulations and digital games and this issue is addressed. The two primary categories of simulation (discrete and continuous) are also described as well as their basic structure. 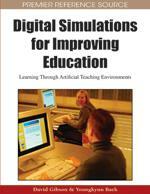 Reasons to use simulations and how they may be used in educational applications are outlined. After having read this chapter, readers will have a clearer picture of what simulations are and how they can be used. Simulations offer opportunities for appropriate practice within contextualized learning environments that are not bound by what is safe, reasonable, or sometimes even possible in real life. Simulations (and games too) are being discussed with renewed interest in both formal and informal educational circles. Though some forms of digital simulations have been broadly accepted as educational technologies for many years, it is only recently that excitement about digital games as educational objects has come to the forefront, and this has returned simulations to the limelight as well. In truth, from a technological standpoint, games are simulations although many educators still distinguish between them. For evidence of this distinction, one need only notice that many schools allow their learners to use educational simulations at school, while games remain strictly ‘verboten’. What do we stand to lose from barring games while purporting to espouse modern instructional technologies? What can we gain by understanding how they can be the same? This chapter will answer these questions, and others. As is the case for any educational technology, whether it be a blackboard, textbook, or a virtual world such as Second Life1, teachers cannot be expected to embrace any of these things as tools for learning without a sound understanding of their potential as well as their limitations, and they should not be expected to use them in class unless they are confident in their ability to use them effectively to enhance learning and this comes with the experience of use. This includes the use of simulations, and the main goal of this chapter is to introduce the field of digital simulations. As a subject of study, digital simulation is typically taught in post-secondary computer science programs towards the end of a four-year program, and such courses usually include a large textbook, a considerable amount of math, assume considerable programming expertise, and an expectation that those taking the course will come out of it being able to design and program their own simulations. Such a course would not be suitable for most educators, but an educator should not need a computer science degree in order to understand simulations well enough to use them. While the authors believe quite strongly that it is important to have a thorough understanding of any technology one intends to build or use for learning purposes, it is also true that the depth of understanding needed to implement a simulation is quite different from the level of understanding needed to use one effectively as a tool. This introduction is intended for educators and any others interested in understanding digital simulations better. It is not intended as an introduction to simulation for computer scientists, engineers, or statisticians. Be able to describe the distinctions between computer (i.e. digital) simulations and other simulations such as live action role play, and physical models. Have a clearer understanding of what a digital simulation is in both the larger sense as understood by the computer simulation community at large, and in the narrower sense as it pertains to education. Be able to describe what distinguishes a discrete event simulation from a continuous simulation. Understand how all digital games can be seen as simulations and the implications of distinguishing between games and simulations based on traditional educational definitions. Be able to describe the basic anatomy of a digital simulation and explain the roles that each part plays. Define pseudo-random number and explain the role of randomness in a simulation. Appreciate the pivotal role of time in all digital simulations. Appreciate the distinction between being a subject matter expert in something, being able to describe that thing so it can be simulated, and actually implementing and testing the simulation. Understand why a faithfully realistic simulation may not be an effective tool for learning in most situations. Be able to identify situations where simulations could enrich learning. Be able to assess whether there is a need for expert help when designing simulations for the classroom, as well as to critique the potential effectiveness of a simulation design.